India’s challenge today is not one of natural resources. It is not about money, human capital, technology or legislation. It is not merely a question of implementation of laws and distribution systems. Nor can things be ‘fixed’ merely by providing education for all. Clearly something more foundational—more profound—is missing. We need to change our mindsets, redefine development and our materialistic way of life, and rethink our narrow and rigid identities. In its platinum jubilee year in 2011, the Tata Institute of Social Sciences (TISS) set up The Programme for Noetic Action (PNA), pioneering a new field to redefine the development paradigm to make a difference in the lives of people, particularly those who are poor and being marginalised. TISS is committed to generating knowledge and education for a just and equal society. Three of us in TISS innovate and move initiatives in the PNA: Professor Parasuraman as visionary thought leader and Director of TISS; Gomathy as professional anchor; Sudarshan as implementer of this approach in our projects. Dr. Monica Sharma supports us in designing learning programmes and large-scale initiatives; she guides and nudges us to strategic action. Pervin Varma’s leadership and Gulan Kripalani’s writing in the initial period was invaluable. Traditionally, development has been restricted to addressing structural change and immediate solutions—middle and inner circles in Figure 1. There are very few techniques or methods to source the inner power of individuals. In contrast, work on sourcing inner wisdom has been separated from work on structural change and delivering measurable results; it is confined in the outer circle, with little responsibility for addressing social challenges. Noetic work is different in that it begins by sourcing people’s inner wisdom (outer circle) to manifest the values of social justice. From this fresh stance, it addresses systems-level causes and patterns (middle circle) to create alternatives for human action (inner circle), valuing people’s dignity and nature’s abundance. The synergistic integration of the three domains—problem solving, shifting systems and sourcing wisdom—is the transformational leap that noetic work generates. The Programme for Noetic Action has eight key components: strategic project design for action at scale; learning-in-action workshops and courses with all stakeholders; breakthrough initiatives to achieve results; recruiting and training in noetic action and placing young professionals; surveys and data collection to make the invisible visible; faculty and student engagement in villages and slums to address problems; a package of technological, financial and logistic support for personnel; and active multi-sector partnerships for results. What do we do, who do we reach, and where do we work? TISS is unique in its commitment to social change and well-being. “The role of higher education in social sciences to address people’s development issues has never been more critical than in a globalized world interconnected by technology,” says Professor Parasuraman. PNA engages with faculty and students. We work in very different and diverse situations: with people in rural and tribal villages as well as urban slums; in the highest mountains and in coastal areas near the Bay of Bengal and the Arabian Sea; and in plains in the heart of Maharashtra, Madhya Pradesh and Jharkhand. To give a broader context, Parasuraman notes that only about 18% of young people with graduate degrees get jobs because most don’t have employable skills. Our programme is a response to this problem. A total of 50,000 students from 30 rural colleges in nine states will earn additional certificates through extra classes alongside their bachelor’s degree. Over three years, several projects, courses, workshops and field-based activities have been designed and implemented to deliver measurable results related to food security, livelihoods, basic entitlements, and human rights and education, based on dignity, equality and justice. The PNA engaged with over 1,500 people, ranging from students to heads of organisations, to foster their stewardship capacities, think critically through contemporary national issues, and act in alignment across organisations, sectors and disciplines. Worldwide, the thinking on policies, rules and regulations is done by a few for the many, with the assumption and justification that people and citizens do not have the expertise to influence policy nor the ability to think critically. The noetic approach creates ways to stimulate critical thinking along with authentic processes to give a voice to everyone, not just the experts. Equally, we see that engaging policy makers in a noetic way breaks barriers, generates robust partnerships and co-creates a different reality. We offer workshops on “Changing the Paradigm: Valuing Life Differently.” Participants represent every walk of life and sector. We also create platforms where dignity and equality are the foundation of engagement between stakeholders and partners, even when social and cultural differences are marked. In 2012, our milestone workshop “Rural Transformation: Thriving Communities” broke class and language barriers and fostered partnerships at a whole new level. Bankers and village chiefs now work as equals, discovering each other’s power and wisdom, generating respect and openness. YPs thereafter engaged villagers and are building leadership with the same distinctions, tools and techniques that we use for national leadership. This levels the playing field. Now it is possible to develop leadership at both grassroots and at the national level in the languages we think, create and act! Deteriorating ecosystems and global markets, coupled with poor credit access and support systems, are critical reasons for farmers’ suicides. In India, over 3.2 million cotton farmers are estimated to be in debt, with little or no access to financial capital. It is here that financial inclusion plays a critical role. In May 2011, Parasuraman established a partnership with IDBI Bank, the world’s tenth largest development bank. TISS YPs were placed in nine villages with 10,000 people across three states—Maharashtra, Madhya Pradesh and Chhattisgarh—to ensure financial inclusion, particularly of rural poor. Through the Programme for Noetic Action, YPs learn and operate in a radically different way. The PNA approach unleashes the courage to create. Results generated by YPs include increased access to capital (YPs have helped create 800+ savings accounts); facilitated access to entitlements, social security and pensions; activated or organised farmer’s clubs; established purification plants and rainwater harvesting in drought-prone regions; promoted livelihoods, enterprises, credit and market linkages; facilitated construction of village infrastructure such as roads, toilets in schools for girls, and water supply; and built people’s capacities in villages. Gomathy sees how every initiative and action implemented with the PNA approach ignites change in systems underlying major challenges. Snehal brings young women 18-24 years old together from all the different castes (transcending social barriers in many Indian villages is hard) to create Self Help Groups (SHGs) and mobilize finances for livelihood. Sudhir Maske stands for equality; when he starts work in a village, he realizes that all the power is concentrated in the hands of a small community. The majority of Dalits and Adivasis are marginalised. He works steadily to empower a woman Dalit representative and with her, mobilizes youth and improves sanitation. The village is selected for the Nirmal Gram Award. “Farmer suicide is a big issue and the aim is to develop leadership within villages to tackle problems and look at alternative ideas,” says Dayanand Waghmar, who is establishing a resource centre for farmers, increasing organic farming practices, and helping villagers get direct access to the market to sell produce. Fishing, community and Sudarshan; Fisherman—what’s in the net? Consider a totally different scene: Ladakh was called the crossroad of High Asia, where weary travelers on the Silk Route paused for a brief respite from their perilous journey in days gone by. Ladakh is caught in a whirlwind of change today. As new lifestyles, practices and social mores enter the Ladakhi community against a backdrop of centuries’ old indigenous traditions and culture, both a new prosperity as well as uncertainty and confusion reign. TISS assisted Ladakh to complete micro-plans by 2010. Rigzin Spalbar, the Minister leading the Government of Ladakh, is clear about the strategic direction to strengthen local governance. He encourages political representatives of the district hill council, local administration, elected village representatives and civil society. Since May 2011, over 90 participants have engaged. They design projects and implement actions for village development and governance for thriving communities, environment conservation and sustainable agriculture and livelihoods. Changes unfold. Minister Rigzin Spalbar and field team leader Sonam Jorgyes said, “there is great resonance between the spiritual culture of Ladakhis and principles and techniques rendered through the noetic programme.” A new level of trust and confidence is generated between the village representatives and the formal leadership of Ladakh. For example, in 2013, after a noetic leadership programme in TISS Mumbai, 73 Panchayat leaders (sarpanches) met two Central Government Ministers in Delhi. Using the new tools they have learned, they unpack systemic problems of National Rural Employment Guarantee Act in Ladakh, speak powerfully and make specific committed requests to the Rural Development and Panchayati Raj Ministers, who then align the scheme to Ladakh’s context. root factors of deprivation and marginalization remain the same. Since the noetic approach is neither prescriptive nor based on a particular ideology, solutions emerge from inner capacities and systems thinking here too! India’s 7,500-kilometre coastline is under tremendous pressure, stretching from West Bengal in the east to Gujarat in the west. Development processes are becoming a threat to ecology and to the livelihoods of people living on the coast. Nearly 23% of India’s shoreline is affected by erosion caused primarily by coastal structures developed for ports. The Coastal Area Mapping Project enters the space of change through information for policy formulation and decision-making. Sudarshan’s early work with Probir Banerjee, the founder of PondyCAN, makes the invisible visible. For the first time in the country, we discover an alarming statistic: the majority of ports in India are located within 20 kilometres of another port. With around 100 operational ports in India and 76 new ports being proposed, there is definitely cause for alarm! Parasuraman spoke about this at the 2012 Biodiversity Convention in Hyderabad. This was the beginning of shifting policy. We raised questions: Is it economically efficient to have so many ports? So closely located? What are the impacts of such ports on coastal ecosystems and communities? The power of visualizing and analysing geo-spatial information is that it brings forth critical questions never asked before. A report asked these vital questions. We work in an ecologically distinct bioregion, PVAC— Puducherry state, Viluppuram (including Auroville) and Cuddalore, along the Coromandel Coast in Tamilnadu. From this bioregion, scientists, policy makers, administrator, managers, community leaders and civil society come together. We use the conscious full-spectrum approach to design and implement initiatives based on possibilities and systems thinking. Multi-sector partnerships now implement a six-point agenda reviving coastal ecology and supporting communities. “It is a journey of learning, leadership-in-action and, more importantly, about doing the same things but differently. I realise I stand for compassion, and working from compassion makes a world of difference in my workplace and personal life,” says Adya Shankar from TISS. Probir says, “This conscious full-spectrum programme created a huge shift in me. By practicing, clutter in my mind seems to have disappeared, my weaknesses do not bother me anymore and I see problems as opportunities for growth, helping me to realise my full potential. I am able to inspire others to committed action and build synergy for a paradigm shift in all projects. I am seeing results as never before.” In 2013, government decided to stop constructing a new port based on Probir’s advocacy. Our Journeys, Our Contribution: What is Unique and What is Different? Personal transformation is a necessary but not a sufficient condition for societal change. This programme enhances ability as leaders to ground, source and value their (and others’) wisdom as the most important determinant of sustainable change while being in action for tangible results. 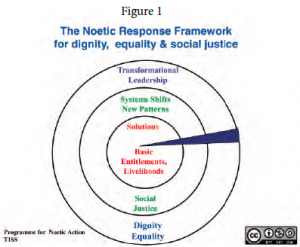 Programme for Noetic Action moves rhetoric to reality. We begin our work by looking within—to our attitudes, our world views and the spirit that informs our decisions even in the face of opposition. We ask ourselves, who am I, and do I embody the values that underpin the human rights principles? The programme is about measurable results for people. It is about moving from partial responses to a problem to a response that transforms society towards equitable and sustainable change. When TISS moves into its platinum jubilee year, it signals for Professor Parasuraman a time to both celebrate and introspect. Why do so many development projects fail to show measurable results on the ground? Why are the changes we see so fragmented and incremental? Why have we as a society failed to create well-being in spite of planning, resources and intent? We are proud to set up a pioneering programme that promises to redefine the development paradigm. We introduced a new field through the Programme for Noetic Action. It is rooted in the understanding that social change is the journey of every ordinary individual who is concerned about others; that we cannot bring about change unless we change ourselves; and in each one of us who is clear about purpose is a power that can be unleashed that not only addresses immediate problems, but changes systems that perpetuate injustices. In India, this is the first initiative of its kind. We have generated tangible results. We are moving ahead, resolute that we are seeding a bright future with our present actions.